I’d seen so many good things Jennifer E. Smith and her goods but this was first book of hers that I have read. I wasn’t sure what to expect and I didn’t want to have high hopes so I went in with an open mind and hoped for the best. I was fairly surprised by this book. The overall tone of this book reminded me of Sarah Dessen’s books. 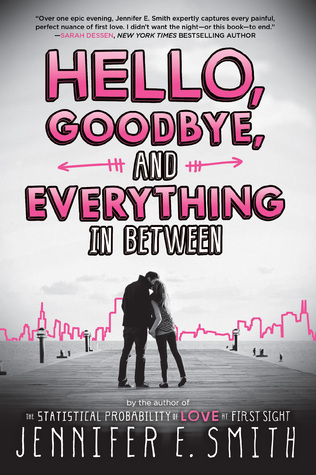 I liked the two Dessen books that I’ve read so that wasn’t a big deal to me but if you’re not into Sarah Dessen’s books, I don’t think Hello, Goodbye, and Everything in Between would be a good fit for you. I liked the writing style of this book but I did think the plot was a little pointless. After I finished it, I kind of sat there like, What just happened? Because nothing really did happen. I liked the characters but I didn’t truly become emotionally invested in them. They acted like love sick teenagers though out most of the book and that was a little annoying to me. But I did think they were well written and could be really relatable for some people. Overall, I did really enjoy this book for a quick, fun contemporary. I feel like if I was more in the mood for this kind of book, I would have loved it a lot. And even though the plot was a bit pointless to me and the characters weren’t really my cup of tea, would recommend this book to anyone who loves YA romance.